An explosion Thursday at a chemical plant in eastern China has killed at least 47 people and seriously injured 90, according to state media. The blast, which created an enormous fireball and registered as a magnitude 2.2 earthquake, occurred at 2:48 p.m. Thursday in Jiangsu, a province that produces much of China’s agricultural chemicals. 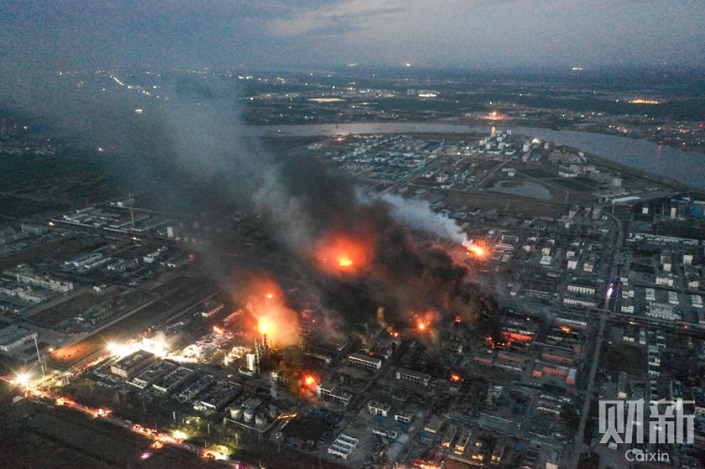 The factory, run by Jiangsu Tianjiayi Chemicals, is located in an industrial park in Xiangshui county, and there are concerns about exposure to the chemical benzene that allegedly caused the explosion. Benzene is commonly used to make plastics and fibers and is naturally found in crude oil and gasoline. Exposure to benzene is known to cause cancer. A worker told Caixin that a fire started in a truck carrying natural gas, and expanded to tanks storing benzene. The worker witnessed two blasts, and said the area outside the facility was chaotic with people rushing to escape. The government has not officially announced the cause of the blast. By 6 a.m. Friday, 16 hours after the accident, there were still visible fires and audible blasts in the area, with black, blue, and yellow smoke rising, witnesses told Caixin. According to public government records, in January 2018, a local inspection group found 13 safety risks at Jiangsu Tianjiayi Chemicals, including insufficient operating rules for benzene storage. A family member of a worker at the plant told Caixin that the company suspended production in 2018 due to safety concerns but quickly resumed operation by the end of the year. Rescues are ongoing, and residents and workers in nearby areas have been evacuated. China’s National Health Commission is also sending doctors and mental-health experts to the site.